Sherman McCoy, un exitoso agente de bolsa de Wall Street, ve cómo su acomodada vida peligra cuando atropella a un hombre de raza negra y se da a la fuga en su coche de alta gama; a partir de ese momento tendrá que enfrentarse a los grandes centros de poder de la sociedad moderna de Nueva York. 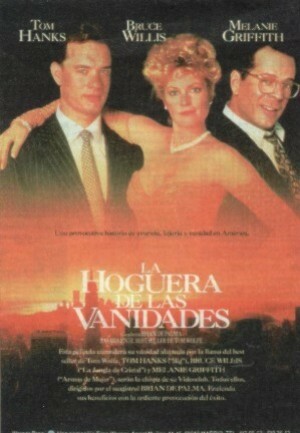 Jennifer Bassey, Norman Parker, Beth Broderick, Richard Gilbert-Hill, David Lipman, Alan King, Sam Jenkins, Kathryn Danielle, Judith Burke, Patrick Malone, Geraldo Rivera, Jeff Brooks, Sherri Paysinger, Nelson Vasquez, Barry Michlin, Tom Hanks, Anatoly Davydov, Bruce Willis, Andre Gregory, Donald Moffat, Kim Cattrall, Kevin Dunn, Channing Chase, Rita Wilson, Don McManus, Kurt Fuller, Marjorie Monaghan, Marie Chambers, Cynthia Mason, Timothy Jenkins, Melanie Griffith, Stewart J. Zully, Malachy McCourt, Richard Libertini, Virginia Morris, Hansford Rowe, Kirsten Dunst, John Fink, Barton Heyman, F. Murray Abraham, William Woodson, George Plimpton, Vito D'Ambrosio, Clifton James, Jon Rashad Kamal, Robert Stephens, Mike Hodge, Adam LeFevre, Ernestine Jackson, Johnny Crear, Susan Forristal, Walter Flanagan, Kimberleigh Aarn, Kirk Taylor, Louis Giambalvo, John Hancock, Richard Belzer, Mary Alice, Helen Stenborg, Paul Bates, George Merritt, Novella Nelson, Morgan Freeman, Saul Rubinek, Roy Milton Davis, Connie Sawyer. Brian de Palma (Dirección), Vilmos Zsigmond (Fotografía), Tom Wolfe, Michael Cristofer (Guión), Dave Grusin (Música).